Sun Cellular on going SunDroid promo sees a new bundle added for the company’s postpaid offerings. 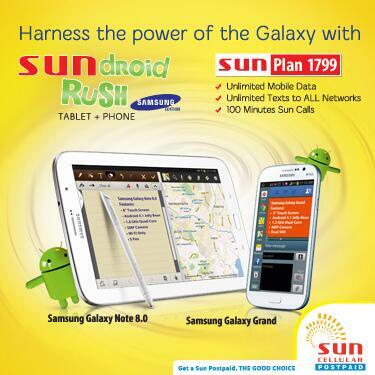 You can avail of a Samsung Galaxy Note 8.0 + Samsung Galaxy Grand with Unlimited Mobile Internet, Unlimited Texts to ALL Networks and 100 minutes Sun Calls at Sun Plan 1799. This offer is also available on Sun Plan 1999. It offers the same freebies and adds, 250 SMS to other networks and 60 IDD minutes. For the complete list of Sun postpaid application requirements, visit http://goo.gl/GEXER. Terms and conditions apply.